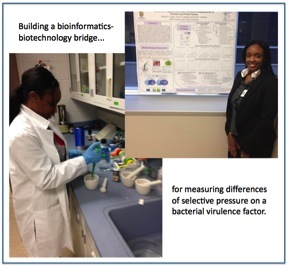 This week’s BEACON Researchers at Work blog post is by NC A&T graduate student Alshae Logan. My name is Alshae Logan and I am a master’s student in the Department of Biology at North Carolina A&T State University. My project investigates virulence factors. Virulence factors are expressed molecules of colonizing micro-organisms that effect progression of disease within their host. In general, virulence factors can enable various phenotypes of motility, adhesion, and toxicity. Motility associates with virulence, biofilm development and invasiveness. Motile bacteria move to favorable locations through chemotaxis. Once bacteria come into contact with the surface, there can be attachment and the formation of biofilms. The initial attachment of cells occurs in two steps, transport to the surface and absorption to the surface. The production of toxins can lead to tissue damage and disruption of host physiology. Virulence factors can vary in relationship to different selective forces of, for instance, niche adaptation and evasion of host defenses. In order to investigate these different selective forces, I have developed a study within the theme of my mentor’s lab (Dr. Scott Harrison) which is to bridge between bioinformatics and biotechnological approaches. In my research, we are analyzing two bacterial strains, Pseudomonas syringae and Pseudomonas aeruginosa, for differences of plant versus animal-host adaptations. The particular virulence factor we are examining is the bacteria flagellum. A primary factor to the evolution of flagella genes in animal versus plant host contexts is the presence of an adaptive immune system in animals. The fliC gene encodes for the flagellin protein, a major component of the flagellar filament structure located outside of the cell boundary. The middle region of the expressed flagellin polypeptide is on the outer surface of the filament, and is expected to be subject to recognition by the adaptive immune system. A hypothesis in our study is that this would lead to antigenic variation due to diversifying selective pressure for animal host-associated bacteria compared to plant host-associated bacteria. To develop this comparative analysis, we assembled a data set of fliC gene sequences from 18 animal bacterial pathogen strains and 18 plant bacterial pathogen strains. For this study, each of these strains has a fully sequenced genome and is from the class Gammaproteobacteria with the exception of the two Ralstonia solanacearum strains which are from the class Betaproteobacteria. This selection of strains was based on the strong degree of prior investigation and unambiguous association with pathogenicity found in the literature. Even though I am investigating one of the most well-studied bacterial taxonomic classes, it was difficult to attain a perfectly balanced comparison across paired subgroups (color coordinated by family in the above figure). It is interesting to ponder what this comparison might have been like five years ago or what it would be five years hence. As a strategy for connecting our plans for bioinformatics analysis to laboratory work, I settled upon Pseudomonas syringae and Pseudomonas aeruginosa, which each have multiple strains with fully sequenced genomes. The general objective we have had is to examined conserved patches of homology across the fliC gene and whether there is a predictable relationship with animal host-related pathogenicity. Shown below is an alignment and structured comparison across fliC genes that I have used for measures of dN/dS and quantitative trait loci analysis. In general, I have been finding promising results (to be published, stay tuned!) that have been connecting bioinformatics methods to our strategies of DNA extraction and sequencing from our P. syringae and P. aeruginosa controls and real-world samples. It’s been challenging to develop a workflow that traverses the many different possible choices for bioinformatics resources, algorithms and laboratory protocols. In my cross-disciplinary training as a BEACON graduate student, I have taken coursework in computational science and have found Python to be a helpful tool for constructing some of the steps for this analysis. As I complete my master’s work and prepare for my next steps into a PhD program, I am excited that this work will live on through the adoption of its different methods and protocols into our undergraduate research training courses and experiences. For more information about Alshae’s work, you can contact her at arlogan1 at aggies dot ncat dot edu.